Now the nights are drawing in and the weather is turning colder you might start feeling a little lack-lustre. Today we’re sharing a DIY beauty recipe that is perfect for a pick me up. It’s a fabulous sugar scrub that will help you buff away those dead skin cells making it look healthier and younger too! 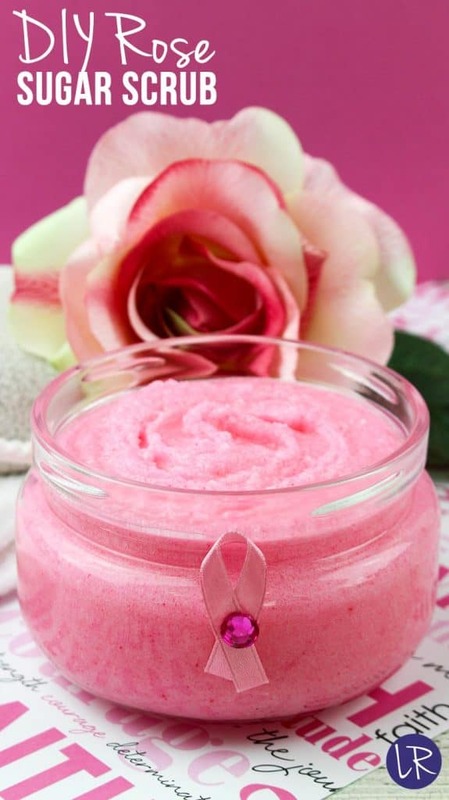 Since October is Breast Cancer Awareness month we decided to whip up a perfectly pink rose sugar scrub to share with you. Rose oil (Rosa damascena) has been used for skin care for thousands of years and it’s perfect for dry or ageing skin. It smells AMAZING and so romantic, and it helps to bring about balance and harmony, and we could all do with some more of that right? Use a medium sized glass or metal mixing bowl (just so the oils don’t seep into anything plastic). Add the sugar and the coconut oil and stir until it’s all mixed together. Now add the rose essential oil and the vitamin E oil and mix it all together again. If you would like your scrub to be pink you can add a small amount of pink food gel and stir it into the scrub mixture. If you don’t add colour your scrub will be white. Transfer to an airtight container and enjoy using within 3 months. That really is it… I told you it was a super simple recipe! 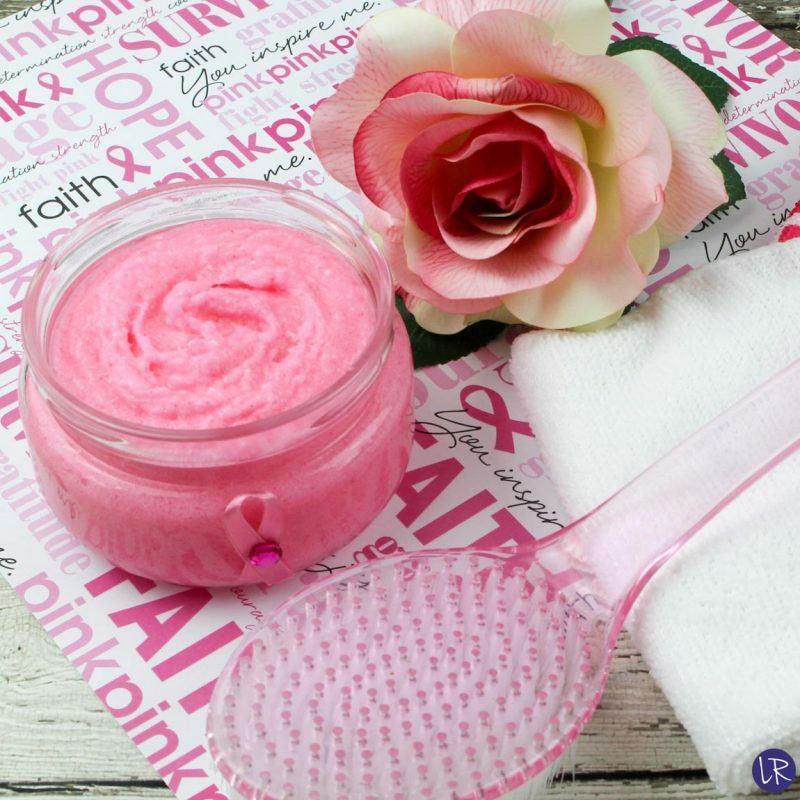 Wet your skin in the shower and generously apply the rose sugar body scrub. Massage your skin in a circular motion so that the sugar granules can go to work gently exfoliating your skin while the coconut oil moisturises. Enjoy the sweet smell of fresh roses! This rose scented scrub smells soooo good you might want to use it every single day. But it is possible to have too much of a good thing! You need to limit yourself to just two to three times a week (less if you have sensitive skin). Don’t exfoliate more often than that or you risk scrubbing away fresh, healthy skin cells! Top Tip! Use your sugar scrub to exfoliate your legs before shaving them. You’ll remove all the dead skin cells that could clog up your razor blade giving you a smoother shave! This sugar scrub recipe is so easy to make why not double or even triple the ingredients and make some up for Christmas gifts? Giving handmade gifts is a wonderful way to show how much you care, and perfect for the woman who already has everything. You could make up a relaxation basket and pop some homemade lavender bath bombs in there too! You do need to be aware that Rose oil can bring about a possible skin sensitivity and if you are pregnant or under a doctor’s care you should consult them before use. You can of course switch out the rose oil for lavender or leave out the essential oils altogether.